On June 13, a team led by Canadians Todd Reichert and Cameron Robertson made history when their human-powered helicopter, piloted by Reichert, sustained flight for 64 seconds, reaching a height of 3.3 meters. 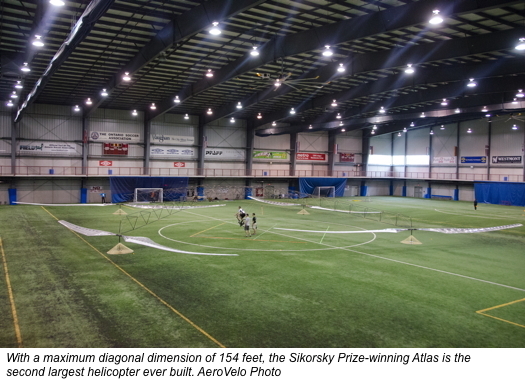 Today, they were rewarded for their trouble with $250,000, when American Helicopter Society (AHS) International and Sikorsky Aircraft Corp. recognized them as the official winners of the AHS Igor I. Sikorsky Human Powered Helicopter Challenge. Since AHS established the challenge in 1980, numerous teams have tried and failed to meet its requirements, namely, hovering a human-powered helicopter for at least 60 seconds, achieving a height of at least three meters, with the pilot remaining within the boundaries of a 10-by-10-meter box. In 2009, Sikorsky made the challenge more attractive by pledging a quarter-million-dollar prize to the first team to achieve what many considered impossible. For a while, it appeared that the University of Maryland’s Team Gamera would win the prize (and in fact, during a series of flights on June 24-26, its human-powered helicopter set an unofficial world record for duration at 74 seconds, although that record-setting flight fell short of the challenge’s three-meter height requirement). However, Reichert and Robertson’s Toronto, Ont.-based team, AeroVelo, came from behind for the win with a dramatically larger aircraft, called Atlas. With a maximum diagonal dimension of 154 feet (46.9 meters), Atlas is the second-largest helicopter ever built, coming in behind the Russian Mil V-12. But while the V-12 had an empty weight of around 132,300 pounds (60,000 kilograms), Atlas weighs in at only around 122 pounds (55 kilograms). Built more like a model aircraft than an engine-driven one, Atlas incorporates carbon fiber composite, balsa wood, polystyrene foam, polyester film, Vectran line and DuPont Kevlar in its lightweight construction. Its transmission is a Cervelo R5ca bike frame, one of the lightest bike frames available. Atlas is not the first joint project for Reichert and Robertson: they previously collaborated on Snowbird, a human-powered ornithopter that in 2011 won them the Canadian Aeronautics and Space Institute’s Trans-Canada McKee Trophy. Neither will it be the last. AeroVelo has more human-powered vehicles in development, including an aerodynamically faired recumbent bicycle capable of achieving highway speeds. For Reichert and Robertson, their pioneering human-powered vehicle work isn’t simply about winning challenges — it’s also about developing the tools and awareness needed to create a more sustainable future. To hear Reichert and Robertson speak about AeroVelo and Atlas, view their TedX talk on YouTube.